Season the chicken pieces with salt and pepper. Dredge in flour, shaking off the excess. Heat half the olive oil in Dutch oven or large saucepan set over medium-high heat. Cook chicken, in batches if necessary, for 5 minutes per side or until well browned. Transfer chicken to large plate. Reduce heat to medium. Add onions, cook, stirring often, for 10 to 12 minutes or until softened and lightly golden. Stir in carrot, fennel, garlic and ginger; cook for 3 to 5 minutes or vegetables start to soften. Add turmeric, cumin, coriander, cinnamon, fennel, cayenne, salt, and pepper; cook for 1 to 2 minutes more or until fragrant. Stir in tomato paste; cook for 1 minute. Stir in broth and bring to a boil. Add olives, dates, lemon juice and chicken back to pan. Reduce heat to low. Simmer, covered, stirring occasionally for 30 minutes. Continue to cook, uncovered, for 15 to 20 minutes or until chicken is tender and sauce is thickened. Stir in cilantro. 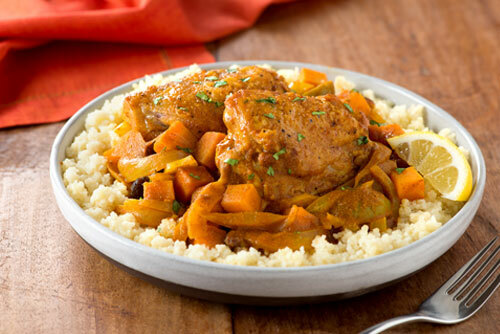 Serve with couscous, if desired. Garnish with lemon wedges.